On Sunday after church (where I saw John Tesh! - see sidebar), I went back to Home Depot in Hollywood to get the hardware I would need to put up my folding table. 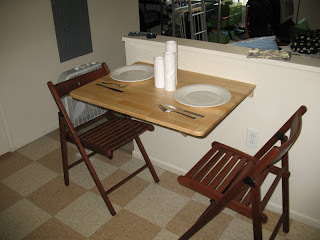 I have a half-wall separating the kitchen and living room, and had purchased a table from Ikea that mounts on the wall and folds down when not in use. Its a great addition to my kitchen... except that Ikea gave me all the hardware to assemble it, but not the hardware to mount it on my wall - ugh! That part sucked! So I went to HD to get mollies and screws. After a frustrating experience trying to find the tools I needed (between the home depot guy not being very helpful, and some other dude who thought he could help me instead but condescended to me and made me feel like an idiot, it brought me to tears briefly), I did indeed settle what I thought I might need. I got home, had lunch and got to work. I started with the table a little too high and had to restart the screws about four inches lower. So far its sturdy and I am enjoying having a table tremendously. In fact, it was the frustration of not having a table to sit and eat or write at that moved me to make the trip to HD. Here are some pics! I even took one pic with plates, to give you an idea of its cute little size! I still have some concerns about its stability, so it won't be holding valuable dishes (not that I have any!) or super heavy bowls of things, but for dinner its perfect. In its folded down position. It only sticks out about 2 inches from the wall, so its great for a studio apartment! I wanted the darker cherry color, but it was sold out and so I decided that I like this golden color just as much when it comes to kitchens. Here is the table folded out, with the two chairs that I also have from Ikea. I bought the chairs in the darker wood which matches my other furniture, so that if I have friends over and they want to sit, it fits in OK in the living room. :) But how cute is this?!? Here is how it looks during the day. 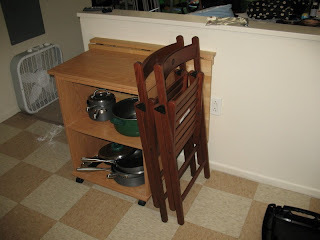 I have this rolling cart which houses my pots and pans, and to make space in the kitchen it goes in front of the table and the chairs lean on the cart. Perfect, right?! A few weeks ago, back before I had anything to do, I decided to explore a local beach. 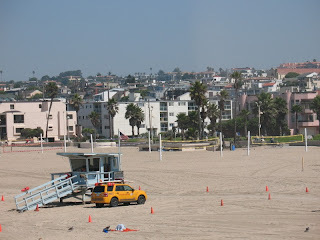 I googled "California Beaches" (seriously) and found the website for (yes, you guessed it...) california's beaches. 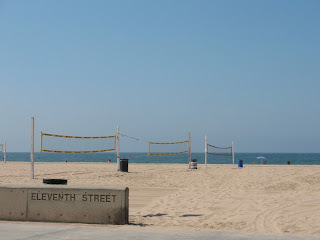 I had heard of Hermosa Beach before, so I picked it, read about it, googled directions and the next day set off. 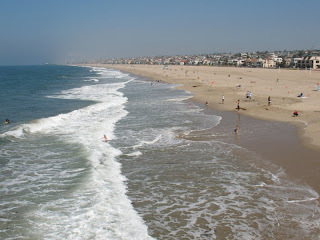 It took about 45 minutes to get there (dang traffic), and I drove through Manhattan Beach along the way. I didn't get to see the beach, but I have had friends tell me that Manhattan Beach is their fave, so I'll be checking it out soon. There was inexpensive public parking, and so I parked and got out and walked out onto the pier. It was a beautiful day, with just the right temperature. There were guys and gals playing beach volleyball on one side of the pier, with kids, boogey boarders, and surfers on both sides. The ocean looked mighty see-weedy from my vantage point, so even though later I relaxed on the sand... I opted NOT to get in. That means that I have been here a month, and still have not dipped my toes in the pacific! I think its time to recruit one of my new acquaintances for a beach trip this Saturday! 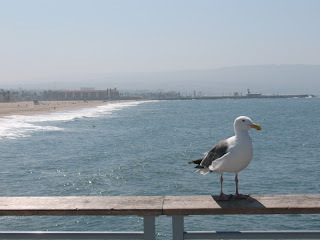 While I was walking the pier, I saw this seagull close up, happily sitting and watching the people (it seemed like). I decided I'd walk to the end and then on the way back, if the gull was still there I'd take its picture... but suddenly (as I walked) the same gull flew forward ahead of me about twenty feet and posed again! So of course I had to stop and get his picture right then! After my walk, I decided to try for some fish and chips. There was a great restaurant right across the bike path from the beach - so I could eat, read, and watch the ocean all at the same time - it was GREAT! 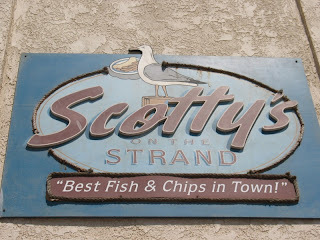 Lunch at Scotty's was reasonable and delicious! I'll for sure be back there again. Following lunch I grabbed my beach blanket and layed out on the sand for a little nap. Delightful day, all in all! I hope I get to have a few more of those, though I'm sure the books I'll be bringing with me will be school related. Enjoy the pics of my time! Well friends, if I were crazy, then I'd probably blog about the debate tonight... but since I ain't (crazy), I'll just say that I watched it - mostly - and I'm bound to be inundated with talk in the upcoming week about how ridiculous McCain is and how stellar Obama is. I'll add that the first half was the worst - on both sides -and that the second half was better. I was about to write in a candidate on the ballot, during the part where neither candidate was answering the questions, ugh, I hate campaigning in the form of debating. Ultimately, I think I am still an Obama supporter, but if the truth be told, I'm one of those people in the middle who isn't sold yet on either candidate for presidency (vp candidates not withstanding). Feel free to comment on this post, but I won't reply :). And if you are impolite in your comment, I will unfortunately have to delete it. Thanks for considering. The real reason that I am posting tonight, is that I'm home (a) and since I had planned to watch the debate, I have no other plans now (except watching "Are you Smarter than a Fifth Grader?" and maybe a movie) (b), and (c) Bethany encouraged me to put some thoughts on "paper" that we discussed on Tuesday night by phone. So I'll try. Bethany was speaking about how as a single person, sometimes (especially in church community) it can feel shameful to be sad about being single or feeling lonely. As though somehow longing for a love relationship is a bad thing. This stems from a lot of things: 1) the unhealth of the church today - we aren't honest with each other, we don't know how to relate to each other and we don't want to be rejected by community, 2) the historic position of the church at large that women are less valuable than men, 3) Paul's admonition to be content in all circumstances - as though contentment is the same as happiness, which I think is untrue (and I think other biblical examples point to the valor of discontent with the status quo- i.e. Moses in Egypt), and 4) the expectation (sometimes explicit) that we are all more perfect if we are married - this is clearly untrue not only by biblical example but born out in life examples, too. Anyway, I have been thinking a lot about being single again lately. (I go through seasons of thinking about it) I think it has been on my mind more lately because of moving to a new place and feeling alone (and lonely), having to do a lot of things alone, and not having a person here to share the day with. It was interesting because as B was talking, I heard her saying she wished she had someone with her to "witness her life" (she may not have used those words, but thats the gist), someone to share the day with, to discuss the personal with, someone to love and to give of herself to (and to be given love back). The first thing I thought of was Much-Afraid (in Hinds Feet), and the second was movies. I recently rewatched Stranger Than Fiction and Shall We Dance? Both of which are excellent movies with very thoughtful parts. In Shall We Dance?, there is a point where Susan Sarandon's character asks a question of a private detective she hired - she asks him why he thinks people get married. Her reasoning is one of the cruxes of the movie, I think. She says she thinks people get married because "they want a witness to their lives," and that in marriage you are saying, "I will care about you; about the little details, I will listen to you." She says that people are saying, "Your life will not go unnoticed, because I will notice you; your life will not go unwitnessed, because I will be your witness." I love that line. At least from what I know of my own heart, I think its pretty true. Bethany and I talked about the fact that desiring marriage isn't just about having someone to witness your life, but witnessing someone elses life, being a part of something outside yourself. a) We need to be more honest with each other! If a few brave singles talked about what they are feeling, others would speak up, too, and everyone would realize they aren't alone. c) You, my dear single friends, are not less or incomplete or substandard because you are single (no matter what messaging you get from the world). d) It is OK to bring these issues with you to God - sometimes I have some really good knock down drag outs with God on this topic! Trust me, the God who created the universe can handle your concerns. e) Also, there is a way to be content in your circumstances, even in the midst of being lonely. By recognizing that there are parts of you lacking, recognizing that there is a void in your life that needs to be filled - and then considering that Jesus loves you fully and completely, you will find some measure of peace. Then, taking those lonelinesses, concerns, and fears to God, you can experience the peace that passes understanding. For me it often means a contented discontent. I would give up all my hopes for marriage if it means that I could serve God better, or bring Him more glory. At the same time, the desire of my heart is to have a partner who I can share life with in all different ways. For now, I am content to wait (though the Lord knows my heart! ), and make myself available for all the opportunities I can to serve God and to meet someone who captures my heart. Blessings to you, my dear married and single friends! While I still lived in Phoenix, I saw my grama a couple times after grampa passed away. She mentioned once or twice about how surprised she was that your heart could actually ache, when it was broken. On Sunday it was the one month anniversary of my grampa's passing. The four weeks has gone so slowly in some ways, and so quickly in others. In thinking about it, my heart has rebroken. My chest aches. Its good that I'm rereading "Hinds Feet" (see earlier posts), because it helps me articulate my feelings and emotions better in prayer. When I was in Phoenix, there was just so much going on. We were doing all these things to take care of the details that surround death: find the paperwork for the car, the bank accounts, the will; get a copy of the death certificate; notify social security; pay the hospital bills. While doing all of that, we were also talking to grama daily, and it seemed like half our time was taken up with these details. The other half of the time, for me, was taken up with preparations for the move. Time went so quickly during those two weeks. Then we were moving and I was getting settled and trying to get residency and job details sorted out. I was driving to Burbank to Ikea and to Target in Hollywood and looking up churches and DMVs and Libraries on the internet. It has been hard to be alone here for the two weeks, but I have not spent very much time reflecting, I've just been numbing myself to get through the time. But last night, it all broke through. I realized that I have been so unaware of the day and date (its not really something I need to know, most days) that I had completely missed that the one month anniversary was Sunday. And I thought about how much I miss my grampa. How much I miss calling the park where he and grama lived and hearing him answer the phone. How much I miss grama writing at the end of an email or letter "Grampa joins me in sending all our love." How much I miss the idea of him at Christmas or in Laughlin. And I was broken-hearted, too, that I hadn't realized it was one month, so that I could talk to my mom and grama about it, and about what they are experiencing. So I wept. I wept for the loss all of us had experienced, and I felt like the Lord was so close to me during that time. The Daily Light reading that I read that night reminded me that the Lord will wipe away every tear in Heaven, and I was so glad. It actually allowed me to weep more! I'm grateful for all the condolences from my friends. I'm thankful for the understanding of people I've been around when I was absentminded or got teary in conversation. I glad for my family, who has borne up under this strain admirably. And I'm grateful to my grama, who is trying to make a life without her dearest love, for showing me what it means to persevere and adapt. But with all of that, I'd still rather have grampa. Here are a few pics from the new apartment. If you are on facebook, you can check more pics out there. the living room, looking from the front door. my desk and bed, also my craft area, to the left of my desk - you can only see the sewing maching and craft box, there is a crafting file cabinet by the stripey board. my adorable little kitchen. my favorite part right now are the rails I put up above the sink to hang paper towels, hot pads and other stuff. looking into the bedroom area from the front door. To the immediate left (can't see it in the photo) is my bathroom. It is nice and roomy, too, and I put a dresser in there for linens and one of my great grampa's paintings on the wall - its very homey. looking into the living area from my desk. I have a "library" on the right, with my two bookshelves full of books. At some point I may have to give some up, but I think that will be the hardest to part with... I can get rid of clothes, movies, etc... but books?! I'm not sure I blogged about my church experience last week... so if I did, please forgive the repetition... :) Last week I visited Richfield Community Church - where the senior pastor is Todd Chapman! Todd was the pastor of my church in Seattle (United Evangelical Free) and he and his family moved to Southern Cali about the same time I moved to Illinois - five years ago. I had reconnected with two of his kids, Casey and Carson, about a year ago, over facebook. Casey and Carson were in the youth group when I worked with high school and junior highers. I knew I wanted to get over to RCC as soon as I could, and Casey and I connected and she invited me for my first Sunday in town. I made it there in just over an hour (seriously, things are far here... well, they take a long time to get to) and just in time for church. I enjoyed Todd's sermon tremendously. It was only the second time I had been to church since my grampa passed away, and I find that the Lord is particularly moving my heart in church settings. The sermon was on James 1:1-4 and considering all our circumstances joy. Todd's message is still knocking around in my head, even a week later. Me and Casey - she is so adorable and grown up! We're all friends now, so we wanted one with Stephanie in it. Casey and her great bf David. I got there about 20 minutes before the contemporary service started. The campus was already full of people walking around, signing up for stuff, drinking coffee. This part was all outdoors. The church is on top of Mulholland Drive and overlooks the valley. Its really a pretty view and campus. I sat for a bit and just enjoyed the nice weather. Once the service started, the music was really great - I have been at UBC so long and loved it, but really missed some of the other worship songs that we didn't sing (we mostly sang Crowder Band stuff - which was great, but this was too!) and this band was really good. I loved that they sang some contemporary hymns and some pop CCM stuff. The people around me were nice, and the congregation was very diverse in age, and somewhat in ethnicity. People were engaged in the service, looked happy to be there. It was good. The sermon was the beginning of a series, but it was sound and I enjoyed it. My favorite thought from the pastor today was "God is not interested in making better caterpillars, he is interested in making butterflies." I appreciated this reminder that God is about transformation, not simply improvement. I think its possible that I will end up at this church, but after this series (about 4 weeks, I think), I'll check out Hollywood Pres and a few others just to make sure I've done my due diligence. I always tell students that they should take the time to be thorough at the beginning, so that they find a church home for four years rather than 6-9 months. I want to have a church that I can call home for my entire time at UCLA, so I have to remember that taking 8 -10 weeks to find a good church is just a drop in the bucket when I will be here for something like 200 weeks! Well friends, thanks for coming along this journey with me. I will post more as I have other new experiences. And I'll try to put up pictures of the area as the days go by and as I journey around. Each new season in my life, it seems like I always end up reading “Hinds Feet on High Places” again. I’ve blogged about this allegory by Hannah Hurnard in the past (on my other blogs), and so I hope you’ll bear with me. Each time I blog about a different part that hits me (I think) so hopefully it is new for all of us. Briefly, for those who are unfamiliar with the book, it is the story of Much-Afraid and her journey to the high places. Much-Afraid is crippled and can hardly walk; she is unattractive to look at, and as her name infers she is afraid – really afraid. But she makes a commitment to follow the Shepherd, and he agrees to lead her to the high places where she will be made whole. The book is the story of her journey. I think the reason that this part brought me pause today was that as I read the first part – about being made into “what he is determined that I ought to be “I thought: hmmm, I wonder what he plans to do next. And I wondered if it would be difficult or rather… how much more difficult. And then I turned the page and read the rest of Much-Afraid’s thought and she thought the same thing. What is great about this book, however, is that it really clearly demonstrates God’s faithfulness to those who are on the journey to the high places. Much-Afraid only needs to call out and the Shepherd is there with her. She is accompanied on her journey by two companions: Sorrow and Suffering – but these companions are strong, help her to be strong, and assist her through the difficult parts of her journey. And all the time, the Shepherd has her on a path that will ultimately lead her to the High Places… it may not be a direct path, but it’s the path that will make her most ready for the high places themselves. In each new season of my life I learn more about myself. I revisit areas I thought were dead and gone (fear, insecurity, etc). And I reconnect with the One who has been faithful through all these moves and changes. May the love of the Shepherd be yours today, and may you know his faithfulness as you walk you journey to the high places. Engaged TV Watching and other updates. Well friends, I am mostly settled in my new apt. I haven't put anything up on the walls and I have a little bit of organizing to do... hopefully that accounts for the delay in putting up pics. But I will say this: I'm excited about my little bitty space! Today I officially became a California resident... just in time! Because I had to take a CA written test to get my new driver's license, I happened to learn that I had 10 days, as of moving and taking up residency, to get my license... and the 10th day is today! I wanted to wait, though, until I got the title for the Olds in the mail, so that I could register my car AND get my DL at the same time. Well, the I got the title yesterday, and I worked a little bit more on studying the driver's manual, and this morning I got up early to make my way to the DMV. There was a hitch, though. First I had to get some smog check. I decided I'd just stop at the first place I saw and get it done - so I managed to do it, but it put me about 30 minutes behind my original schedule. (I had wanted to get to the DMV RIGHT at 9am, so it would be faster) Kudos to the CA DMV, though, it was fast and efficient and I was helped by some very nice women there! So after about two hours at the DMV, I had my car verified and registered, I had taken and passed the written test (I missed three out of 36, but I could have missed 6 and still passed), and gotten my picture taken. Now I have a fancy paper receipt that doubles as my driver's license until I get mine in the mail. Side note: I think TX still does this, too - but in AZ they printed my DL right there and I thought that was AWESOME! I loved that I left with my actual license in hand! Well, that was my big accomplishment of the day. :) Oh, that and getting my laundry done. Onto my other big topic... engaged TV watching. I realized that because I 1) live alone and 2) don't really know anyone around here yet and 3) I'm not in school, so I don't have any studying to do.... I am watching a lot of TV, especially at night. And while I watch TV, I am on my laptop. But for the first time EVER, I have been googling and going to websites as I watch TV - websites, etc, that are being talked about or advertised on the TV I'm watching. Seriously. And suddenly I understood this idea of engaged TV - or integrated TV, maybe. So if I see an interesting commercial I might go to the website, or I was watching Project Runway and Diane Von Furstenberg was a guest and I wanted to know more about her... so I googled her and read about her on Wikipedia, I also look up actors on IMDB while I'm watching them on TV (did you know Drew Carey is 50 years old?!?). Anyway - does anyone else out there do this? Tonight I'm going to conciously put away my laptop and work on a scrapbooking project, but tomorrow, I know I'll be back on - playing "Tetris Friends" on Facebook (its really fun - you should add it), looking up stuff, and generally being a plugged-in hermit. To be honest, I'm looking forward to being with friends and stopping this whole computer dependency thing! OOOH, last thing before I put away the computer! I started BSF last night!!! WOO HOO!! For those who are my friends, but haven't heard of BSF - it stands for "Bible Study Fellowship" (www.bsfinternational.org). BSF is an interdenominational bible study that takes place all over the world. I joined the young adults (single men and women 18-35 yrs old) group that meets in San Gabriel. Previously, I was in the Seattle young adults group, and even joined the St. Louis group for one year. The bible studies are AMAZING! I credit most of my bible knowledge to the foundation I gained attending BSF. There are also women's and men's groups, so its not a "singles" thing - its a legit bible study. This year we are studying the Life of Moses, from Exodus to Deuteronomy. I did this study back in Seattle in 2001, but I am really excited to see how I encounter scripture as I go through these books this time. I know that it is going to be a challenging experience! We picked up the trailer on Sunday, and loaded it with all my worldy possessions.... OK, it didn't quite all fit in the trailer, but my dad did a great job of loading the trailer, truck and my car. We played one final summer smackdown of Settlers (dad won) and went to sleep early so that we could leave before dawn for LA. We planned to leave around 5am and actually got on the road about 5:30. It was a good drive, but long (7 hours total) and we got to LA around 1pm. I got my paperwork and keys and we started unloading. It took a long... long... long time. Not quite as long as it took to load, but way harder work. By the time we were done unloading we were exhausted and hungry. However, we wanted to drop off the trailer before we ate. UHaul gave us a drop off place in Santa Monica, and so we eventually made our way out there (got a little lost) and when we got there the parking lot was blocked off!~ Ugh, what a hassle - when I called them, they told me "there wasn't enough room" for our trailer! You can imagine how frustrated we were. So we got some snacks at a gas station and headed to the next location given to us (I had recalled UHaul). That happened to be near my parent's hotel, so we parked and got them checked in. You can imagine at this point we were all a little cranky and still really hungry... but, Ikea was only open until 9pm, and it was already 7, so we decided to head there and eat while we shopped. Well, it was the last day of a three day sale, so it was crazy, but we got the things that were urgent (i..e my bed!) and decided we were too tired to eat there. We left Ikea at 8:30 to head home. (Bet you didn't know you were in for this much detail when you started reading, huh!? I figure this is what I would tell someone on the phone, so you're getting it here). While mom and dad looked at the bed parts, I ran to the local grocery store (Ralph's) and picked up some food to eat. I got back and it was 10:30pm. So we were all exhausted, I couldn't even think, I was so tired. But we decided we were too tired to put together the bed, so we ate a little and said goodnight. Tuesday was a better day - I got up early and unpacked the kitchen, and mom, dad and I went to breakfast at this little bakery down the street. Then I went to get a parking permit, while mom and dad started on the bed. When I got back.... turned out one of the pieces was damaged so we had to go to Ikea AGAIN to exchange it. We had a really nice early dinner at In n Out and then got back home and finished the bed - thankfully. It was quite an experience to get it all together. My folks were supposed to leave around 3pm... but instead left at 7:30!! I am so grateful for them staying so much later than expected to help me get the bed together. That task alone was too much for one person!! Since Tuesday, I have been running errands and unpacking. I did some shopping to get a few things (storagy) that I needed to make the apartment work better, got my bruin ID card, and have put together my desk area. I am almost ready to take some photos and share my apartment with all of you! The loft bed was a little scary at first, to be honest, but now that I'm more used to it, the little wiggles it makes when you get on it aren't such a big deal, and it certainly expands the space I have! I think I'll enjoy my little desk area underneath it, and my little living room is looking great. I have a gas stove and oven and that is taking some getting used to, but by next week, I hope I'm an expert! Final couple things: I am planning to start BSF this week, if possible. There is a Young Adults class (can barely believe I still qualify for that class!) on Tuesday nights, so I'm excited to get started and meet some people that way. I have made a couple new friends and hopefully will continue to get to know people better. And I think I'm going to make it a "regular date" to go to the corner bakery on Friday mornings for breakfast. Photos to come. Thanks for your prayers. You will forgive the long delay in posting, I hope! My last post was the day after my grandfather passed away, and it was hard to get back to posting for a little while after that. We left Tahoe, with bittersweet feelings, on Saturday the 16th, and when we got back to Laughlin, Nevada (where we had originally met my grama and grampa and picked them up), I drove Grama back to Lake Havasu City in her and grampa's car. It was so sad for us to be driving back from Tahoe without grampa, and I felt it keenly, as where he would have been sitting in the van was instead a bunch of "stuff". Then grama and I had a good drive back to Havasu, but it was sad and hard for both of us. I was really glad, however, that I was with her for a couple days at the trailer, as I think it would have been even harder for her to be there alone. As it was, I left on Monday and it was a hard week for all of us, especially her. But while I was there, we went through all their papers and boxes to look for important things like the car title, and other stuff. We found some really neat papers and family memories, and I was really pleased to be a part of the discovery. I learned a lot about grampa and grama and I shed a few happy and sad tears together. I returned home and found that I wanted to do nothing - seriously, I was lethargic and tired. I have done a lot of grief counseling over the last few years, but even knowing what to expect, I was too lethargic to think about it! I took a lot of naps, and sat quietly a lot. One other thing I did, and I think it was a healing experience for me, was make a photo scrapbook of my grandparent's 60th anniversary celebrations (the first couple days of the tahoe trip) for my grandmother. My parents and I went up the following Saturday to Havasu, picked her up and we returned to Laughlin so she could go back again and get that experience over with. Afterward I gave her the album, which made all of us cry, and I was glad to have had the opportunity to spend time with those memories before giving it to her. OK, so then I started packing and making the final arrangements to get here to LA. That is what I will talk about in the next post.